Today, we’re happy to introduce the TurnSocial Leads bar, a simple way for you to increase the number of website visitors that you convert into leads. When we first started TurnSocial, we knew exactly what we wanted to accomplish – delivering a free, simple tool that raised visitor engagement and social interaction on our customers websites. Over the past few years, the TurnSocial bar has been installed on over 7000 websites, and is now seen by over 300,000 people per day. In recent months, we added support for numerous new features – Google+1 buttons, LinkedIn sharing, Satisfacts Resident Survey scores – and made numerous upgrades to our infrastructure, in an effort to deliver content even faster at scale. We do our best to maintain an open line of communication directly to our customers, and are constantly asking for feedback, constructive criticism, and suggestions for how we can improve our product. One common request we kept hearing over and over from customers was, “How can you help increase the number of leads I get on my website?”. People were quick to tell us how happy they were with our current product, but we soon realized that increasing social interaction was really only half of the battle – we needed to build something that helped close the engagement loop. Many of our customers spend thousands of dollars every month driving traffic to their website in an effort to grow their business, yet do little more than offer one or two basic forms to collect visitor contact information on site. There are a number of reasons why this may be, but regardless of what they are, we believe we can help. Which brings us to where we are today. The TurnSocial Leads bar rests stylishly at the top of every page of your website (see the one on this page? ), and offers a customizable space for you to create your own unique call to action message. Visitors can connect with your business by one of two ways – either through traditional email sign-up, or via Facebook Connect. Each lead collected through the TurnSocial Leads Bar is delivered directly to your email inbox and includes a personalized lead profile. Using the Facebook Open Graph, this lead profile provides some basic information about the person behind the email address – including their name, interests, influencer score, and more – along with what page they were viewing when they connected and which site referred them. Our goal is to not only increase the total amount of leads collected through your website, but also to provide you with instant customer insights to be used when crafting your follow up message. We think it’s a great start, but have even bigger plans for the future. It’s an exciting time. We’re offering a free 30 day trial for anyone who signs up to use the TurnSocial Leads bar, which will transition into our standard plan of $20/month, per bar, at the end of 30 days. Our flagship product – the Social bar – will always remain free, as promised. We look forward to hearing all of your feedback, and can’t wait to share with you where we’re headed next. If you’re on Twitter, make sure you connect with us and let us know what you think. Thanks for stopping by! Get your TurnSocial Leads bar now at TurnSocial.com. 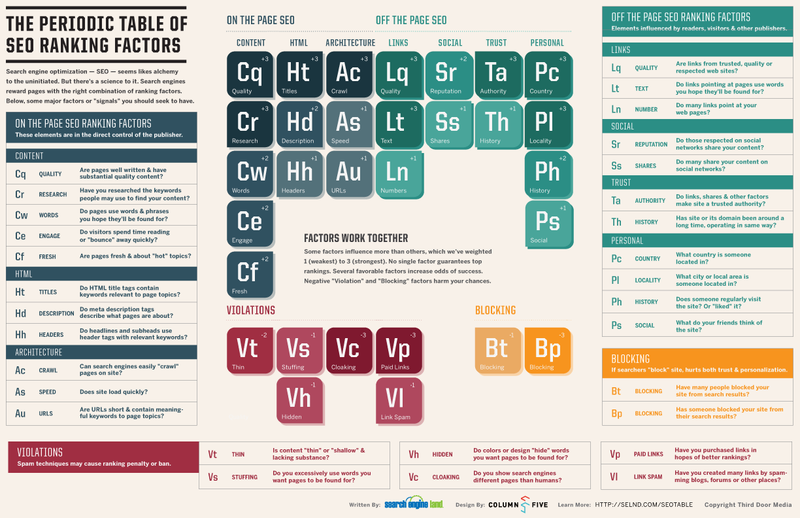 Great infographic from the folks over at SearchEngineLand entitled The Periodic Table Of SEO Ranking Factors. Click that link above and hop on over to their website to grab one of your own. Over the last few weeks we’ve been rapidly making updates to the TurnSocial bar, so I thought I’d take a quick moment to bring everyone up to date with what we’ve been up to. First and foremost, we’ve had lots of requests for us to introduce support for RSS feeds on the TurnSocial bar – so I’m happy to announce that we pushed an update over the past weekend that does just that! TurnSocial customers can now easily add any RSS feed they’d like to a toolbar directly through their admin screen – just one more way to deliver useful content to visitors on every page of your website. Don’t want to use RSS content from your blog? No problem – why not get creative and share your Quora “Answers” feed? We look forward to seeing the myriad of ways our customers use the RSS feature to interact with visitors on their websites, and we’re very happy to finally offer support for this long-desired feature. It’s always been great that visitors to your site can see what you’ve been up to on Twitter, but now with our built in Twitter follow button they can also follow you with just one click! No need to enable this feature – just check your TurnSocial bar, and you’ll see that the update is already live! Another new tweak to the TurnSocial bar you may notice is an enhanced “Share” button, with a clear call to action next to the “Share” icon. We heard you loud and clear when you told us that you thought many people couldn’t immediately identify the “+” sign as an area of the page to share from, so we’ve taken this as the first of multiple steps to increase sharing engagement. Have more suggestions for how we can improve the toolbar UI? Feel free to shoot me a message at matt at TurnSocial.com and let me know – I’m always up for hearing new ideas. Between support for RSS, built-in Twitter follow capabilities, a few minor UI tweaks, and our announcement of support for Satisfacts Resident Ratings, the last few weeks have been quite exciting for us at TurnSocial. We have some very cool things we’re working on behind the scenes right now, and I can’t wait to share them with you over the coming months – so why don’t you pop up that little Twitter icon on the TurnSocial bar below and follow us to stay up to date with what we have in store? Thanks again for all of your continued support – here’s to a great second half of 2011! We’re happy to introduce an exciting new feature for our partners in the multifamily industry – the ability for apartment companies to add SatisFacts Resident Ratings directly to their community website with the TurnSocial bar. A community’s website is an excellent source of inbound leads, and it’s our job to do everything we can to increase your rate of visitor conversion even more. The addition of SatisFacts as a supported app means you now have an additional tool in your arsenal to deliver engaging content for your visitors to connect with. One of our goals at TurnSocial is to expand a community’s ability to market itself beyond simply showing/telling prospects about the property. The TurnSocial bar provides the context of the community’s presence on popular social networks, as well as local information about the surrounding neighborhood. How walkable is the neighborhood? What do current residents have to say about the area? What popular restaurants are nearby? TurnSocial enables access to social media profiles and location-aware content from WalkScore, Rentwiki, Yelp, and more directly onto apartment community websites to help prospective renters learn the answers to these types of questions. And now, with the addition of ratings from SatisFacts annual surveys and Insite™, its 365-day/year feedback program, we’re helping to improve a community’s online reputation and marketing appeal even more. SatisFacts is the multifamily industry’s leading resident satisfaction survey, retention and performance improvement service provider. Adding resident ratings from SatisFacts provides prospective renters with valuable information from their peers about an apartment community, while creating a powerful way for apartment marketers to enhance online lead generation. Every SatisFacts rating is displayed on a scale of 1-5 stars, and since it’s built into the TurnSocial bar, will appear unobtrusively on every page of your website. Who better than current residents to tell new prospects how great your community is to live in? When you only have a few critical seconds to make a favorable impression on new visitors to your website, every opportunity to highlight your strong points is meaningful. If you’re not currently a SatisFacts customer and would like to get resident ratings for your community, email me at matt at turnsocial.com and I’ll connect you with the right people – they’ve got plans starting as low as $1/per unit per year! Take a look at the example rating we’ve added to the bar on the bottom of this page, and let us know what you think in the comments!